I was walking through a tall cattail (Typha) stand today when I spotted a little glint on one of the flower heads. It was this tiny bug, which resembles a much larger Lygus bug. Despite more searching, I was not able to find any others. 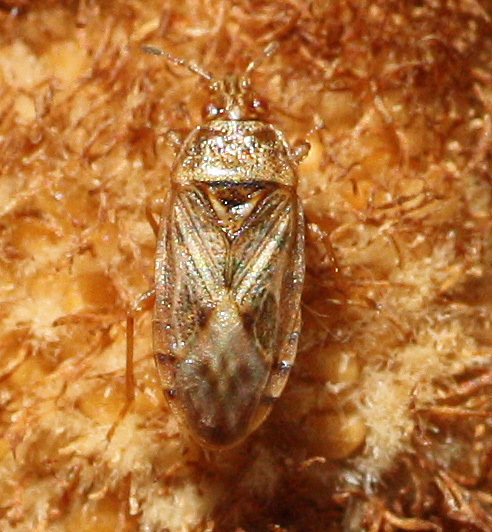 When I returned home I looked up cattail bug and found that there are two introduced species of Arthrenidae, and one of them is called Chilacis typhae - the Bulrush Bug. I suspect that this individual is Chilacis and not Holocranum (the other one), but I am basing the id mainly on range.